​In the south Eli was saved from the side of the road.. he was emaciated, covered in mange and ill. We agreed to him as soon as we heard his sad tale and saw his sorrowful puppy eyes!!. Fast forward to today & Eli is not just healthy, vibrant and ready to live his life... he's even happier than he was on the day he got here!! Seems impossible but its true.. Eli keeps breaking the joy-o- meter!! Eli rocking this fun recall (come!) exercise! ELI is all in to sniff about, see all the new sights at the farm and perhaps most importantly, meet new friends, 2 and 4 legged! Initially, every new dog, tiny or large, younger or older, all got the ELI-explosion-of-joy greeting!! Sometimes Eli's over exuberance can put the other dog off. Every day he is learning how to adjust his own energy level and greeting style to acommodate that of his pals. Eli is a staff favorite when it comes to obedience practice and trick training! He makes everyone look like a super trainer!! It is truly amazing how quickly he picks up on new behaviors. He learned sit in his first days with us and BOOM now Eli sits for everything instead of jumping. A little while later he began learning some new leash walking skills and BAM he mastered some leash skills! Eli learned down in one 15 minute training session and the next day he was already learning to bridge two commands.. go bed and lay down! He is also mastering the come and look commands! We think Eli's past did not consist of a wealth of exposure to lots of people and moving parts... at times he can get overwhelmed with too much going on in front of him and may back away or look to his handler for safety. We have been working to pair these situations with happy positive associations and he has made so much progress! It will be imperative that whoever adopts Eli continues to provide the leadership and safe space he needs to feel secure in new situations. Eli is an absolute blast.. it is impossible not have fun with him! He goes on weekly runs with one of his handlers and happily trots next to her the whole way. 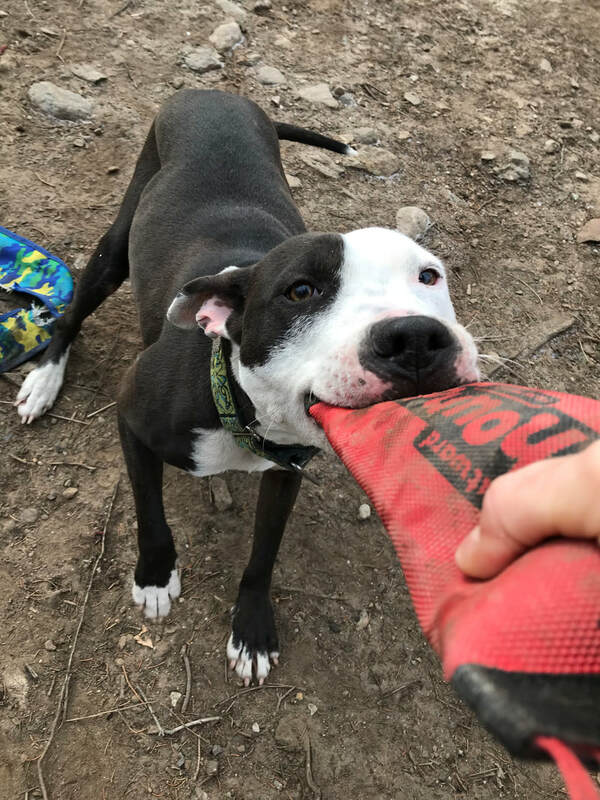 Eli enjoys all kinds of toys and games and really likes a good round of tug of war!! He will tug all day if we let him and his most favorite toy is the flirt pole! 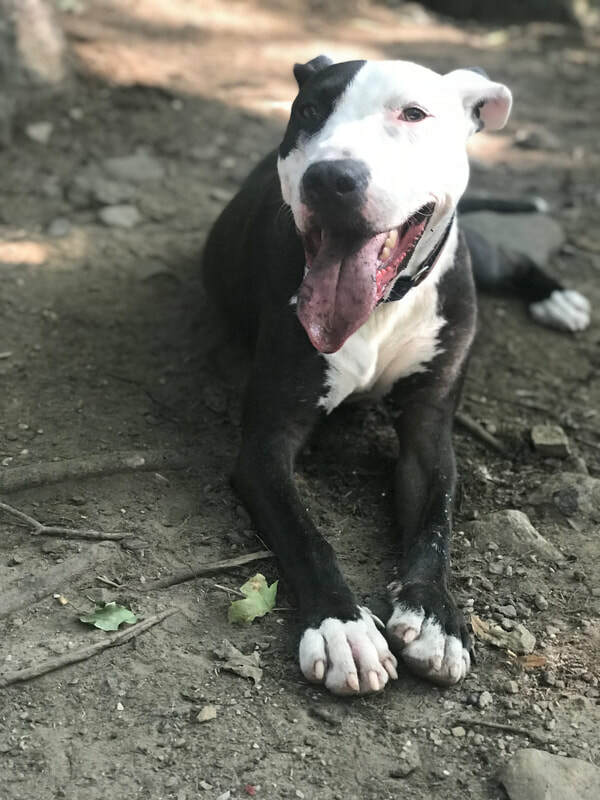 Eli will certainly make someone a VERY happy dog owner along with an incredibly rewarding experience while he continues to gain his confidence! We recommend Eli go to a home with children aged 10 and up.